There are of course 5 (yes, FIVE) other R's in Radiobiology. And for the pedantic, I'll spell in RRRRRadiobiology just to keep you quiet! They are, in no particular order, radiosensitivity, reoxygenation, repopulation, redistribution and repair. Of course the list is open for more, especially molecular biology, but I can't find an 'R' word to make it follow the pattern. I suppose we could something along the lines of “4 Weddings & a Funeral”! 5 R's and a molecular, perhaps? Sounds terrible doesn't it! Anyway the last R in Radiobiology is actually the first – RADIATION DOSE. Put in stark contrast, you can say that 0 Gy has no cell kill effect in normal or cancerous tissue, and 1000 Gy will kill all normal and cancerous cells. That's quite a proportionality! The question for radiation physicists is not so much about the repopulations and redistributions, but more how can I change the therapeutic index while using the normal easily available modality (photons)? I am not prejudiced against protons … really … I've never met a proton that I didn't like. Almost half of my weight comes from protons, and the other half comes from neutrons. Although I feel less positive towards them! In addition, “you fight your battles with the army you have, not the army you want”, attributed to the very wise Dr Kerwyn Foo in 2007, so for us its photons, photons, electrons and … photons! what is the survival deficit when an anaemic cervix cancer patient is treated, when an EGFR-receptor Ab is used with RT? (Ans: cetuximab + RTh = 10% survival advantage over Rth alone). So what are the coming ways that Radiation Physics is going to impact on the biology of cancer cure? There are four areas that I wish to discuss and these are interrelated in some ways. It should come as no surprise to you that the things we treat, move! We don’t dig them up to treatment (well, not while waiting lists are so short! ), so while patients may do their best to act like a lump of meat on the treatment couch, unfortunately they can’t! During the 60-90 seconds of beam delivery, their bladders fill slowly, their rectums fill quickly, they will breathe 12-18 times, they will swallow 3-5 times (more if you ask them to not to swallow) and they will develop ischaemia at their contact points that make them wriggle. The advantage of 2D image sets is that they are easily and reliably manipulated by RTs and software, are already part of the clinical process and can be automated into a rapid sequence of table shifts. 2D image sets are particularly useful for bony targets, soft tissue targets attached to bones (brain, H&N, pelvis) and any soft tissue target with a deliberately placed marker (prostate). And that covers just about the vast majority of sites. I don't include breast here because nothing works there – I repeat NOTHING works there … yet! These image sets are seductive in letting everyone in on the new technology, but such changes should be viewed with suspicion. The manipulation of 3D image sets is currently poorly done by the group who find them the most benefit (the ROs), what will be the effect of including others who have not undertaken formal (can you describe what we got as 'formal' training?) training and have no tradition of 3D image set interpretation? In what circumstance does this offer an advantage? Is this advantage offset by the amount of time needed to quantify changes? Each analysis of patient and organ motion demonstrates that there is a lot of motion, that the errors can’t be additive (if you really added all errors together, some patients would be off the table! ), and that the changes can be quite rapid (over 2-5 minutes). The reality of RT in Australia/NZ is that we are funded and staffed for high throughputs of 35-40+ patients per linac per day (about the only leisurely places are found in North America) . Therefore the process will bear no more than a 1.5-2 minute additional time for the processes for acquisition, analysis and alteration before delivery. The last 30 years of radiotherapy has seen a drive to produce known (my 2Gy = your 2Gy) and homogeneous dose (ICRU50/62 – coverage by 95-107%) . While this is now regarded as an assumption of the ideal, is this true? What does the EUD tell us? After drawing our contours and volumes, it tells us about the probability of TCP in the volume and NTCP in the contours, by assuming that there is a compensatory probability function related to pixellated dose. Within the volumes there is the assumption that dose deficits have a stochastic relationship with control, that is, it is NOT deterministic. In this way, dose deficit and dose excesses can affect the eventual outcome. So what happens if you overturn the 'dose homogeneity' need and focus on minimal covering dose? What does EUD predict? Above are two images as an example of what is possible using IGRT. The dotted line is 'normal' 78Gy and the thick line 90Gy. 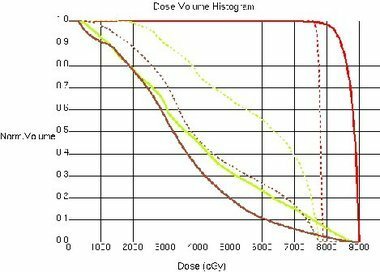 The changes have been to margins (to reduce CTV>PTV from 7mm to 3mm), isodose constriction (reducing field size to move the 80% isodose to the same place as 95% would reside for the old CTV>PTV margin) and dose escalation (isocentre dose from 78Gy to 90Gy). But Just have a look at that DVH below! The rectal dose is now substantially less! And not one second of IMRT calculation time needed! no side effects result from overdosing the cancer. In the same way that a CTV>PTV margin can be added to provide a dose envelope for movement, the same margin can be reversed and used internally in a cancerous mass to treat the central area which never moves outside the defined GTV. This area will contribute nothing to the NTCP since dose always falls within the cancer, provided … and this is IMPORTANT (yes, you need to take notice here) … the tumour does not shrink. So before you try to dose dump you need to know what happens to masses over time and have a reality-based re-scan policy. I suspect that it will be very easy to dose dump in the first 2 weeks of treatment for large tumours, before becoming increasingly difficult with tumour shrinkage. A related issue that goes with this is that it is likely that dose conformality will increase once you dose dump, and so the 'new' radiobiology will start to investigate the effect of tissue sparing. There is an inkling of this in prostate cancer already where the bleeding rates related to the anterior rectal wall peak doses and the sensory changes related to dose to the posterior rectal wall/whole rectal circumference. Only recently has Avi Eisbruch published data looking at painting dose to miss the pharyngeal muscles and improve swallowing function. I have been using a similar technique to spare mucosa and parotids with interesting anecdotal results (less toxicity with chemoradiation where non-circumferential radiation is delivered.